On a day after White Nationalists gathered in Charlottesville, Virginia to protest the removal of a Confederate monument and declared their intent to take back American for white people; a day after violence broke out in that city leading to the death of one and the injuring of others, when a car rammed into a crowd of counter-protesters; in a week when it seemed as if we are on the brink of nuclear war with North Korea, we gather to worship the God who stands firmly against hate, racism, violence, and the destruction of life. We come here needing to say no to white nationalism and nuclear war. 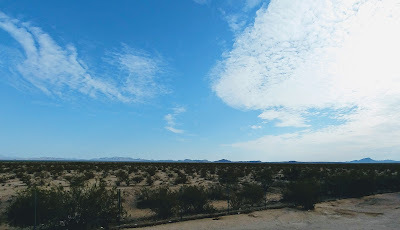 We also come to hear Matthew invite us to use our spiritual imaginations so we can embrace the “impossible possibilities” of the Bible’s miracle stories, so that we can, as Brian McLaren suggests, “play a catalytic role in co-creating new possibilities for the world of tomorrow” [We Make the Road, p. 97]. It is in the midst of all of this that we attend to the story of Jesus walking on water and calming stormy seas. This was supposed to be a simple stewardship sermon. That is what I wrote this past week, before I headed off to Lansing to teach a STEM class, but reality caught up with me and required a reworking of the sermon. I believe this can still be a stewardship sermon, but perhaps the “impossible possibilities” we need to consider, have taken on a different sense of purpose. Last Sunday I shared Grace Kim’s reflections on the “Feeding of the 5000.” She invited us to embrace Jesus’ “vision of the abundant life, the kingdom of sharing God’s resources here and now,” by bringing “any small gifts that we have—money, talent, and time—to dedicate them to Jesus, because he will multiply what we have as we give it to others.” [Preaching God’s Transforming Justice, p. 344]. As the people of God who gather in this place to worship and to serve, our gifts of stewardship enable us to carry out a ministry of blessing. These gifts allow us to be a calming presence in the midst of life’s storms. The question is: Are we ready to get out of the boat with Peter, and join Jesus on the stormy seas of life? This week life has felt chaotic. Storms have arisen. Fear is taking hold. First, we had the escalation of hostilities between North Korea and the United States. Threats were made by leaders on both sides that seemed to suggest the possibility of nuclear war. We prayed that tensions would subside and that diplomacy would lead to a different outcome. I’m still praying. Then, we have this situation in Virginia, in which words of hate and division were spouted by white supremacists, Klan members, Neo-Nazis, followed by violence. These are stormy seas tossing us about. I want to draw us back for a moment to the reading from Matthew’s Gospel. There is a back story to this encounter. The people of ancient Israel were not seafarers. They feared the sea, which is why they often used the sea as a symbol of chaos. Even a lake the size of the Sea of Galilee—which is nowhere near the size of any of the Great Lakes— could frighten seasoned fishermen like Peter and Andrew, James and John, if a storm hit suddenly. This miracle story begins with Jesus sending the disciples across the lake, so he could spend some time alone in prayer. But, as Jesus prayed, the disciples found themselves in a bit a quandary when a storm hit, making their crossing difficult. The winds pushed at the boat, while the waves tossed it. Then, adding to their fears, was the sight of a figure walking toward them. Since people don’t normally walk on water, the only other explanation, was that this was a ghost. So, if the sea didn’t get them, then surely the ghost would. Matthew writes this gospel to a community asking faith questions. Things might be a bit chaotic. Fear might be rampant. Doubts are on the rise. The future is uncertain. They are like the disciples crossing the lake in a boat that seems ready to go down. On a day like this, with hate-filled words and violence in the streets and threats of nuclear war on our minds, does it feel like chaos is tossing us about? We don’t know what was going on in Matthew’s community, but evidently they were feeling pressures from either inside the community or outside it, or maybe both. Matthew shares this story as a word of encouragement. The seas might be rough, but Jesus is there not as a ghost, but as one who calms the seas. With respect to stewardship, the instinct is to huddle together inside the boat. We make sure we have life preservers and cling together. As congregations and the wider church, we often use our time, talent, money and other resources to preserve the institution as institution. When we face the storms of life, there is the temptation to draw inward, but if I read the news correctly, this is not the time to stay within the safe confines of the boat. So we return to the story. When Jesus drew near the boat, the disciples cried out in fear. Jesus responded to these cries: “Be encouraged, It’s me. Don’t be afraid.” Even if Peter was frightened by the storm and the sight of Jesus walking on water, when he heard Jesus’ voice, he asked if he could join Jesus on the waters of chaos. Jesus told Peter. “Come,” and Peter did just that. Yes, Peter’s enthusiasm falters once he got out of the boat and looked around, but he got out of the boat. He took a risk, even if he did need Jesus to rescue him when his faith faltered. It was only after Peter got out of the boat and began to sink, that Jesus calmed the waters. I think that Matthew wants us to know that just because we walk with Jesus doesn’t mean that we won’t face stormy seas. After Jesus rescued Peter from the stormy waters, he asked him: “Why do you doubt?” I know that it sounds like Jesus was being critical of Peter, I prefer to think that Jesus was inviting him to do a bit of self-reflection about the journey of faith. Our stewardship theme this year is titled “Journey to Generosity,” and what I take from that title is that stewardship, like mission, is something we grow into over time as we step out of the boat and join Jesus on the stormy waters. Bazzi Rahib, Ilyas Basim Khuri. 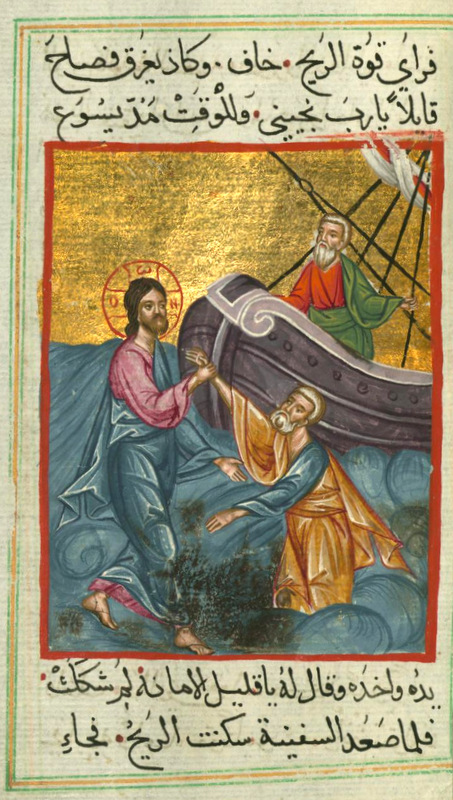 Jesus Walks on Water, from Art in the Christian Tradition, a project of the Vanderbilt Divinity Library, Nashville, TN. http://diglib.library.vanderbilt.edu/act-imagelink.pl?RC=55906 [retrieved August 12, 2017]. Original source: http://commons.wikimedia.org/wiki/File:Ilyas_Basim_Khuri_Bazzi_Rahib_-_Jesus_Walks_on_Water_-_Walters_W59241A_-_Full_Page.jpg. What's this about Immigration restrictions?